Glencoe Literature for 2002 also "makes new things familiar and familiar things new." Designed to meet the needs of today's classroom, Glencoe Literature has been developed with careful attention to instructional planning for teachers, strategic reading support, and universal access that meets the learning needs of all students. Glencoe "British Literature" (2002) also "makes new things familiar and familiar things new." 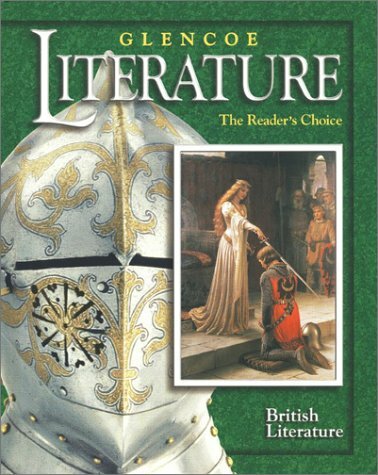 Designed to meet the needs of today's classroom, "British Literature" has been developed with careful attention to instructional planning for teachers, strategic reading support, and universal access that meets the learning needs of all students. 'Genre Focus' introduces students to the elements and characteristics of the major genres highlighted in each unit. 'Active Reading Strategies' shows students the kind of thinking and questioning skilled readers use when reading a particular type of literature. 'Active Reading Models' let students apply the reading strategies that they just learned to a selection. 'Media Connections' provide contemporary connections to many selections through sources such as newspapers, magazines, web sites, song lyrics, and screenplays. 'Comparing Selections' pages in each unit present options for comparing and contrasting two selections through writing and discussions.